It’s the weekend, Florida State fans. As you seek some rest and relaxation, keep it here for the latest in FSU athletics. The news and notes section of this post will be updated throughout the day. 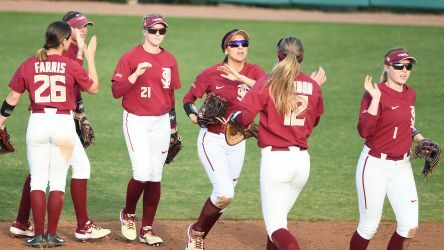 For the first time since winning college softball’s ultimate prize, Florida State took to the field for a pair of contests on Friday. The Seminoles came away with a pair of victories to kick off the JoAnne Graf Classic. FSU opened the day with a 7-2 win over UNC-Wilmington. Shortstop Cali Harrod finished the game 2-for-4 with a run scored and an RBI while Anna Shelnutt and Cassidy Davis each drove in a pair. Dominique Travers homered for the Seahawks in the loss. FSU freshman Kathryn Sandercock got her first career win. The second contest didn’t come as easy as FSU squeaked out a 1-0 win over Iowa State. The contest was scoreless until the bottom of the sixth inning when Sydney Sherrill hit a solo home run — the first blast of the season for the Seminoles. Meghan King picked up where she left off last season, pitching a 3-hit shutout while striking out eight and walking one. Host FSU will continue the JoAnne Graf Classic on Saturday with a pair of games. The Seminoles will face UNC-Greensboro at 12:30 p.m. EST and Iowa State at 3 p.m. EST. In addition to FSU softball, FSU track and field participated in events hosted by Boston University, Clemson and Arkansas on Friday. FSU men’s tennis defeated Auburn, 4-0. In addition to FSU softball, FSU track and field will wrap up events at the same three locations on Saturday. FSU women’s tennis takes on Florida Gulf Coast and North Florida. FSU basketball will host Louisville at 4 p.m. EST on ESPN2. FSU hoops opens as a 2-point favorite over Louisville. FSU topped Louisville on Saturday in overtime, 80-75.